What the hell is a Momo and where the hell have I been? 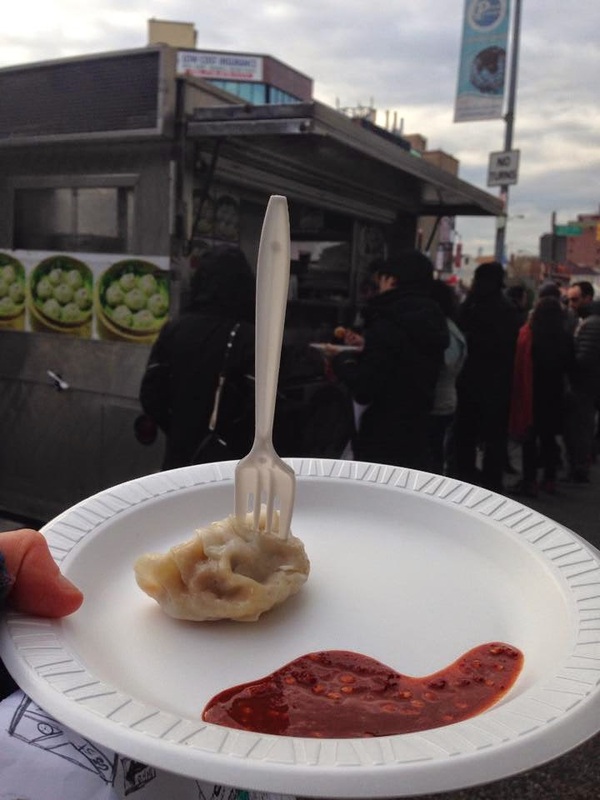 A Momo is a Tibetan/Nepali/Himalayan style dumpling. And I've been really busy, but that has nothing to do with Momos! This post is about Momos! SO MANY MOMOS! Possibly TOO MANY MOMOS? 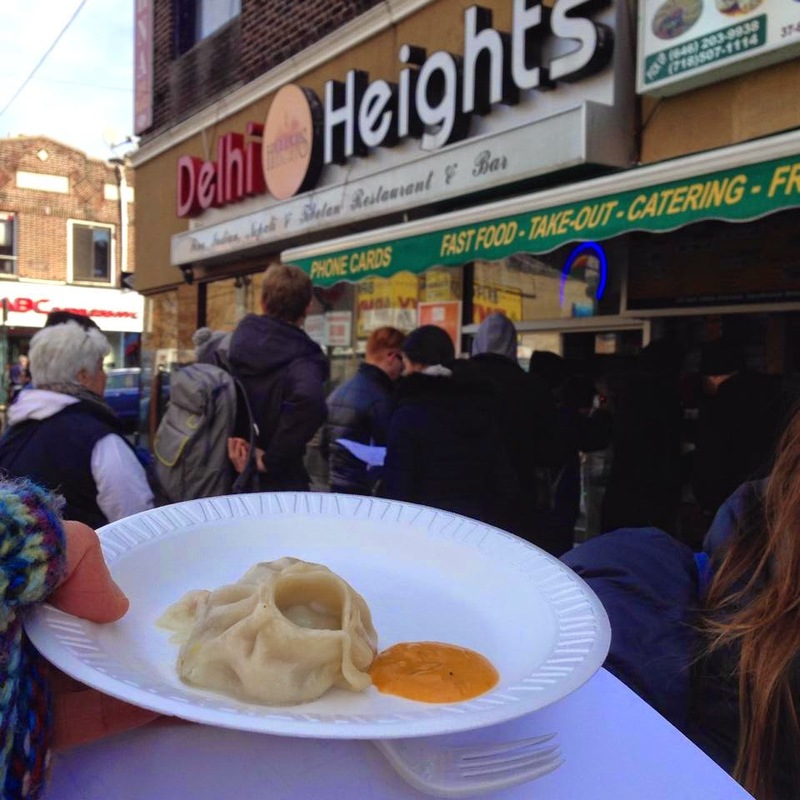 Last weekend was the 3rd annual Momo Crawl in Jackson Heights, Queens, NYC. 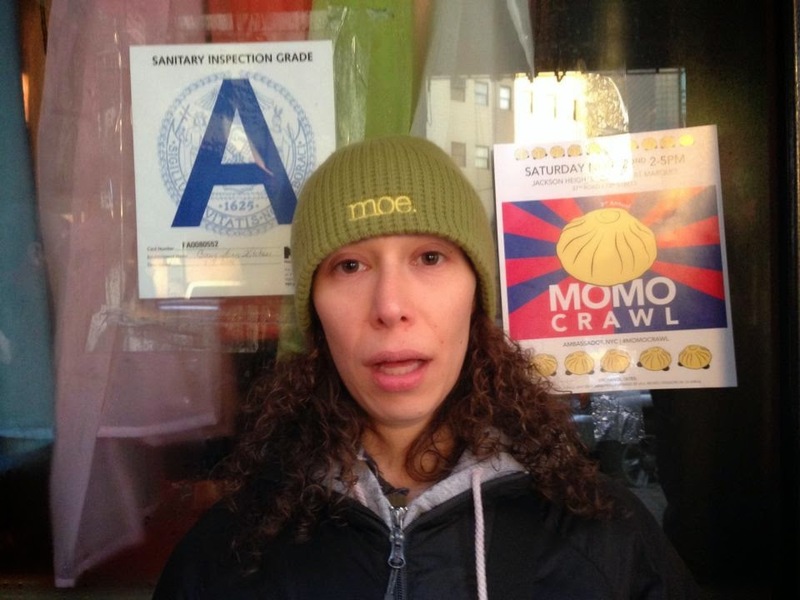 Brainchild of Queens Food Tour Operator, Jeff Orlick, the Momo Crawl has grown exponentially since it's first year, when there were about 30 participants. 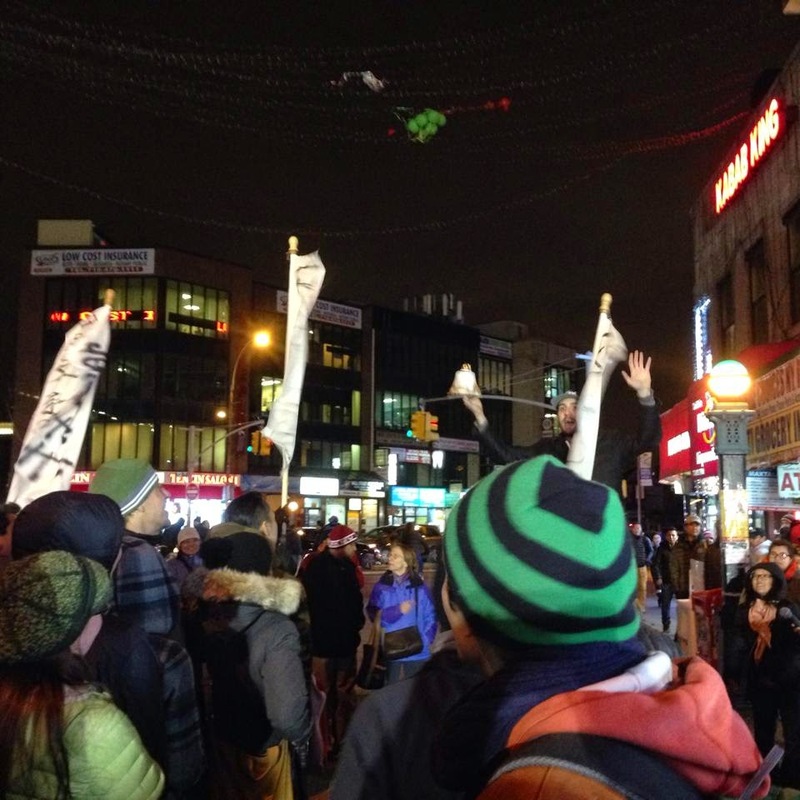 Year 2 had about 100 folks (from what I was told by a Momo Crawler), and year 3, thanks to social media, brought between 700-800 Momo Hungry Adventurers to the 1/2 mile vicinity surrounding the Jackson Heights Subway Station. My friend Caroline and I were 2 of those up for the challenge. 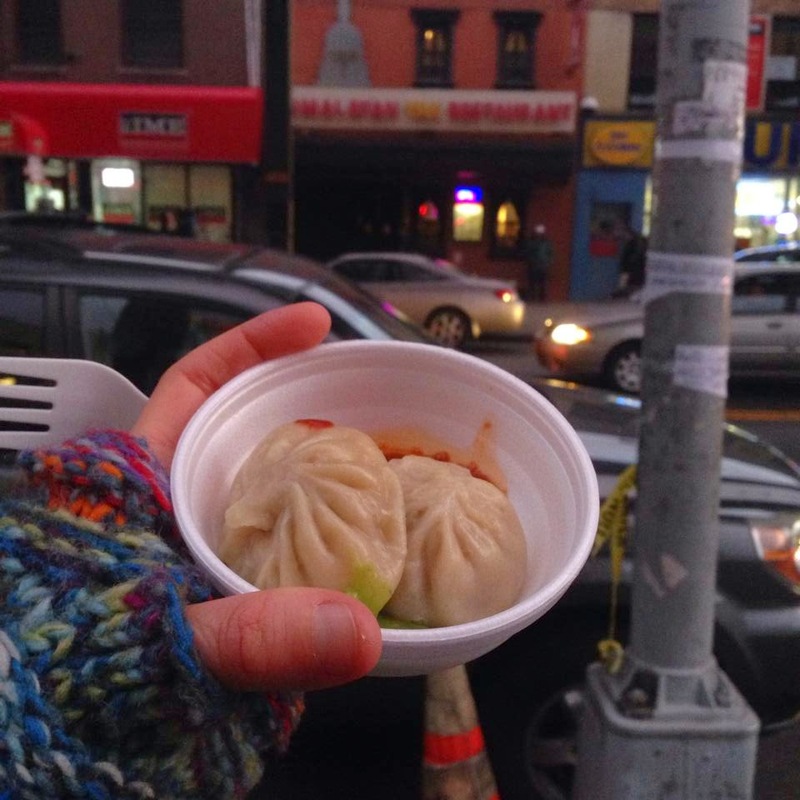 It all began innocently enough, with a headline on Gothamist that posed the question: How many $1 dumplings can you eat at the Momo Crawl? 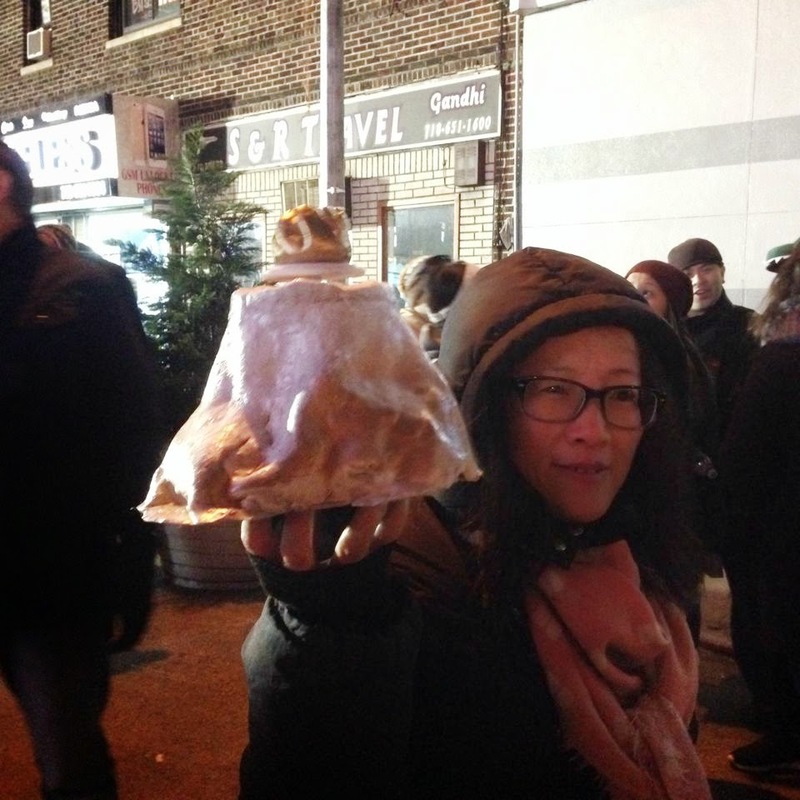 While I had never eaten a Momo before, I said out loud to no one in particular, "I'll bet I can eat a whole bunch of $1 dumplings at the Momo Crawl" and immediately contacted Caroline, who I knew would be willing to play along with this neat event. 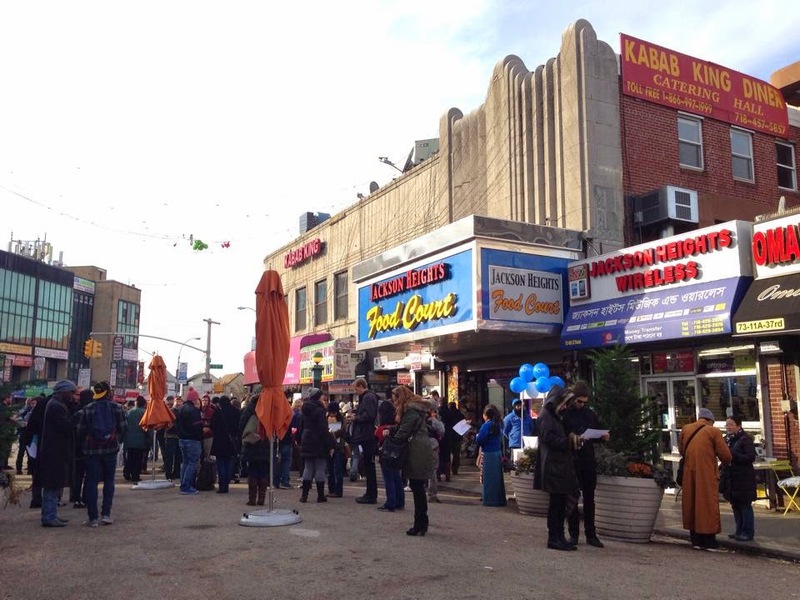 It should be noted that the aim of the crawl isn't actually to see how many Momos you can eat in 3 hours (that's more of a personal challenge), Orlick set it up to bring attention to the multi-cultural mecca that Jackson Heights has become and to introduce the general public to/celebrate Tibetan Food and culture. Works for me! Step 1: Show up, buy the map of participating Vendors for 3 bills of any matching denomination (that'd be $3 in my case). 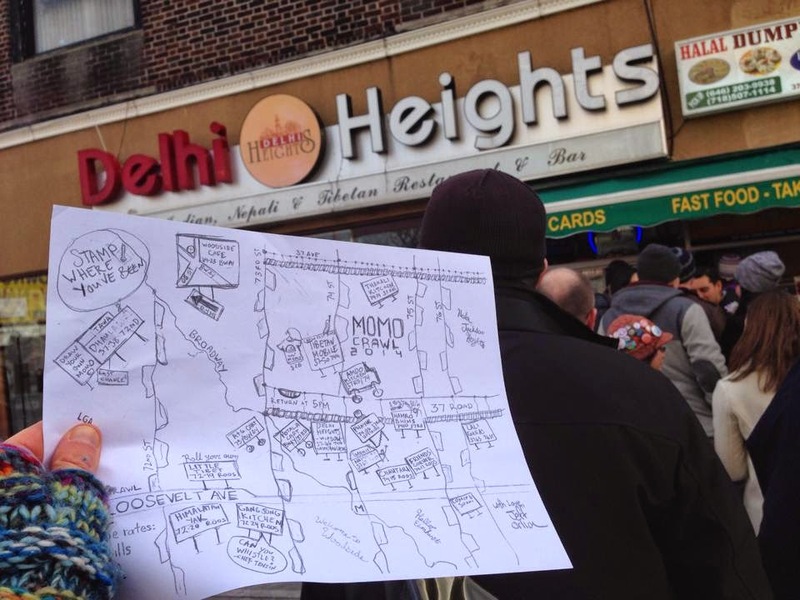 Step 2: Turn around and visit your first location-- Delhi Heights! 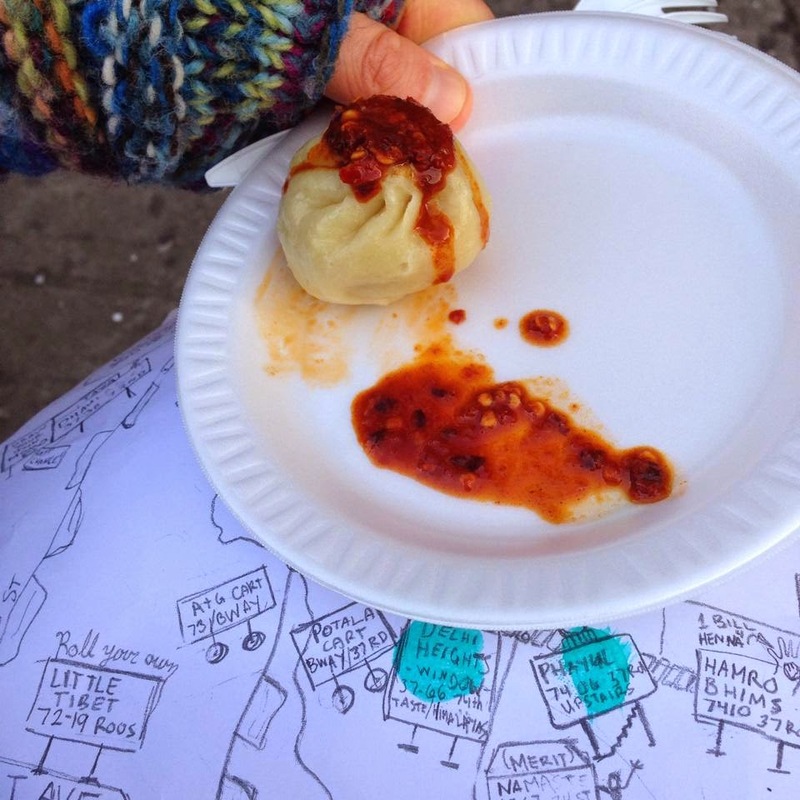 Step 3: Get a stamp on your map and consume your first Momo! In this case, a yummy chicken Momo with a deliciously light & tangy sauce! Please note how happy and full-of-delight we appear as we get ready to ingest Momo #1! Momo # 2: Amdo Kitchen Food Truck - Beef Momo with incredible Pikliz-type Pickled Radish stuff. Best side-dish of the day! I don't typically eat beef, but made an exception on the crawl, for deliciousness & (mostly) time's sake-- wanted to keep the lines, and both of us, moving along! Momo # 3: Phayal (winner of 2013's coveted Golden Momo Trophy) - Veggie Momo (Potato & other Veg). Pretty damn yummy. Reminded me of a Pierogi! Great sauce, super spicy-- the heat was just right for me, but Caroline was talking about it for like 20 more minutes. NEXT! 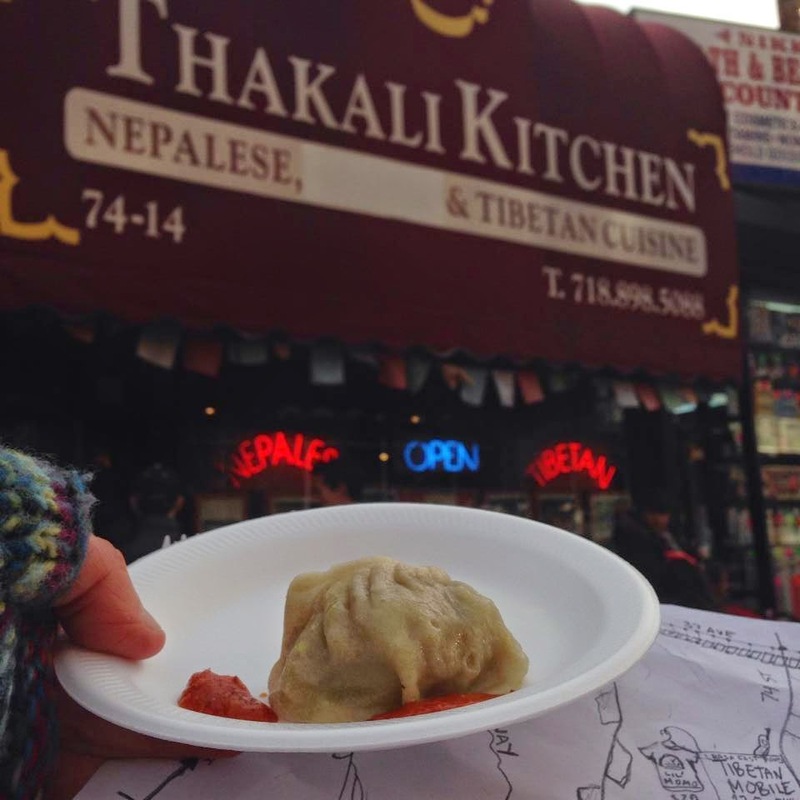 Momo #4: Thakali Kitchen - Chicken Momo. The restaurant smelled divine and the Momo was really yummy. These descriptions are great, right? We made a quick pit-stop at Patel Brothers Grocery, where Caroline bought some Chutney and I was too distracted by the Momos to even consider food shopping. 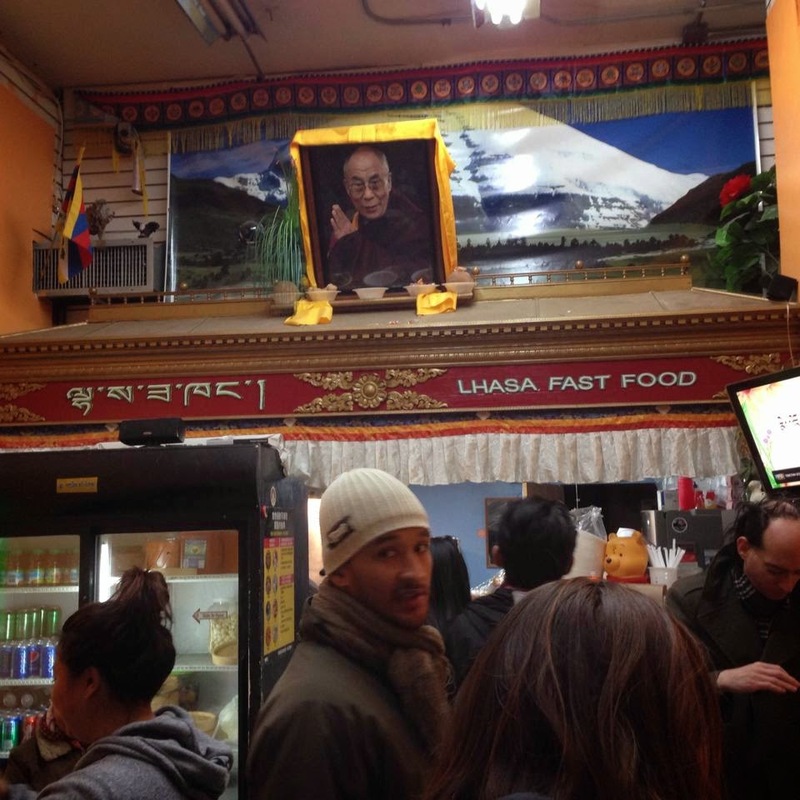 Momo #5: Lhasa Fast Food aka Tibetan Mobile - This food stand was cleverly hidden at the back of a Mobile Phone Store! 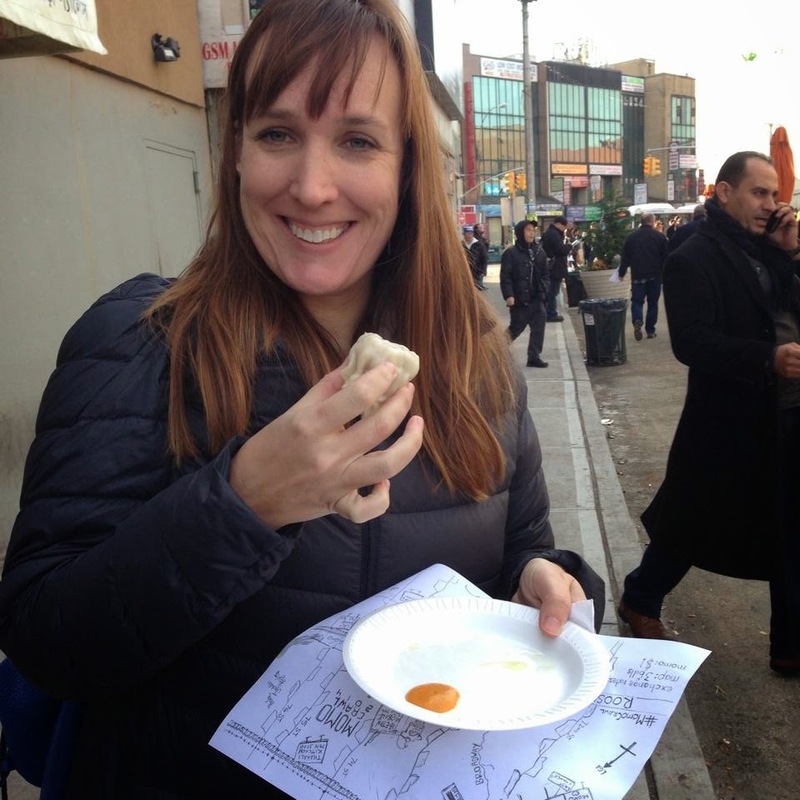 It was marked on the map, but we didn't understand what was going on until Caroline investigated to find the hidden gem that would be our Momo #5: Beef Momo that burst and covered me from chin to chest with broth on my first bite! Damn, that was TASTY! Thanks to the John Legend looking guy in the white hat for stamping my map (so the Chef could keep the line moving) and his general chivalry! Pleased that he did not witness the broth incident. Momo #6: Potala Cart - Chicken Momo that we waited way too long on line for (30 minutes?). First real speedbump of the day. The sole person inside the cart was clearly overwhelmed by the volume of crawlers and simply couldn't keep up with demand. 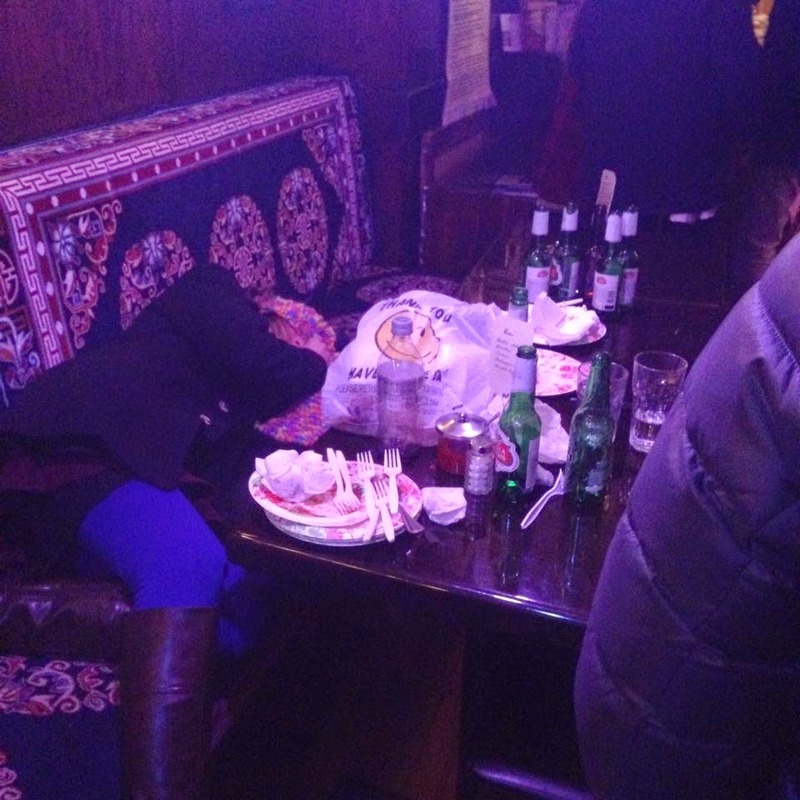 We heard they ran out of Momos by the end of the crawl. Met some nice folks on line, though. Caroline's feet got cold cuz she wasn't wearing socks. Momo was yummy and the sauce was satisfyingly hot. 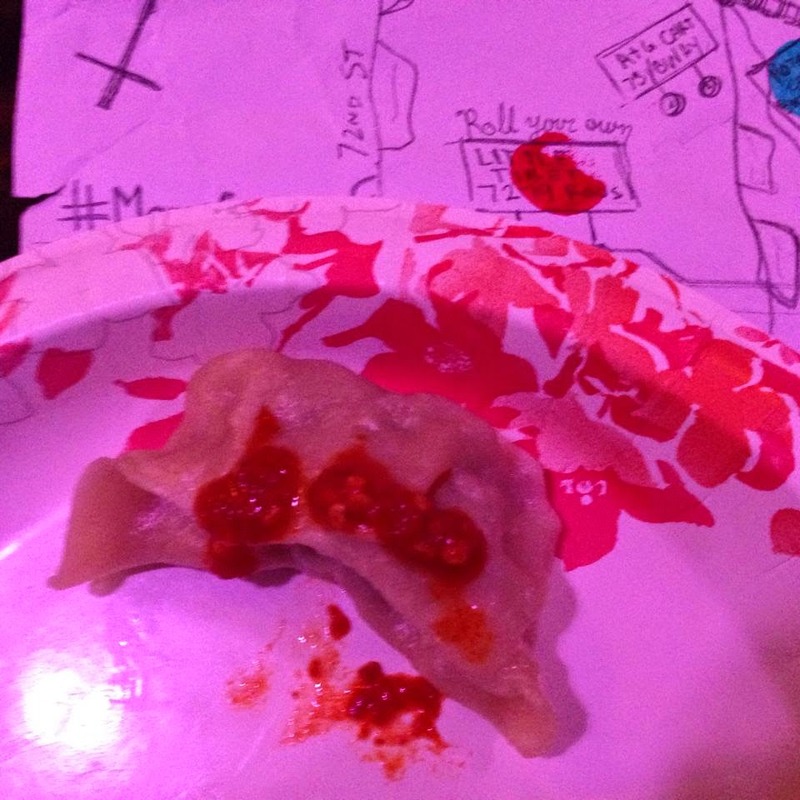 Momo #7: Gangjong - This was my favorite stop of the crawl, but by now my pupils had dilated and I had hit a serious Momo wall while waiting in the line. This is the blank stare of Momo Desperation. What am I doing with my life? Why can I suddenly smell colors? The answer was found in Gangjong's wonderful Beef Momo and incredible hot sauce. This Momo saved my life. The emotional rollercoaster would explain the lack of Momo Photo. Momo #'s 8 & 9: Himalayan Yak - 2 Chicken Momo with two different types of sauce (one red and one green). I got two, out of spite for having to wait so long (25+ minutes) in a deceivingly short line while people ahead of us filled containers with 10-20 Momos, leaving the restaurant lagging behind and rushing to catch up, and also because Momo #7 filled me with a Warrior's Spirit. Mostly, it was spite. 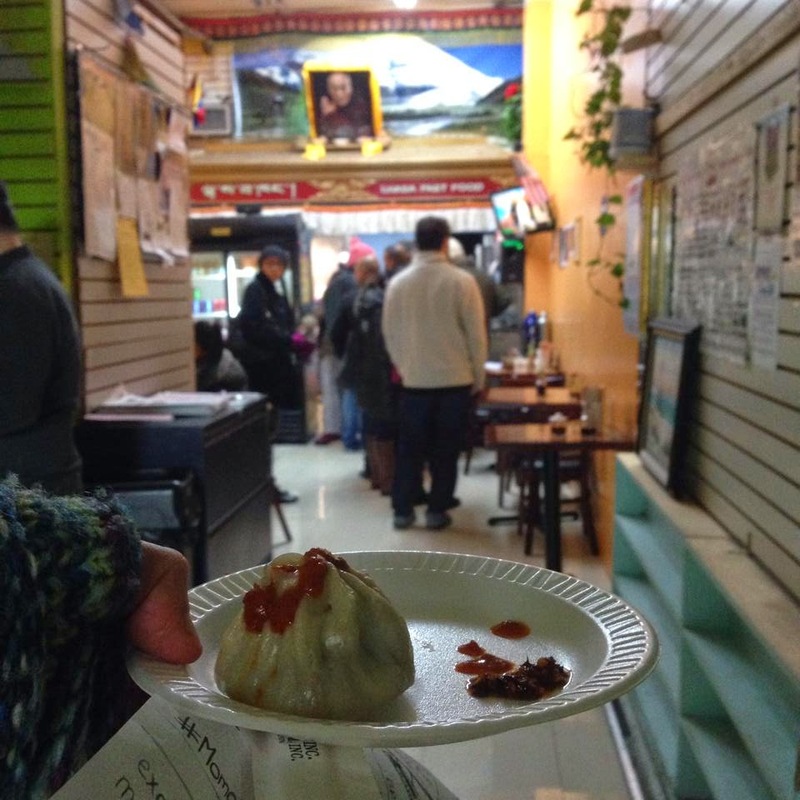 Ate the Himalayan Yak Momos on line at our last stop. We had less than 25 minutes left in the Crawl time and I was determined to make it through Little Tibet! 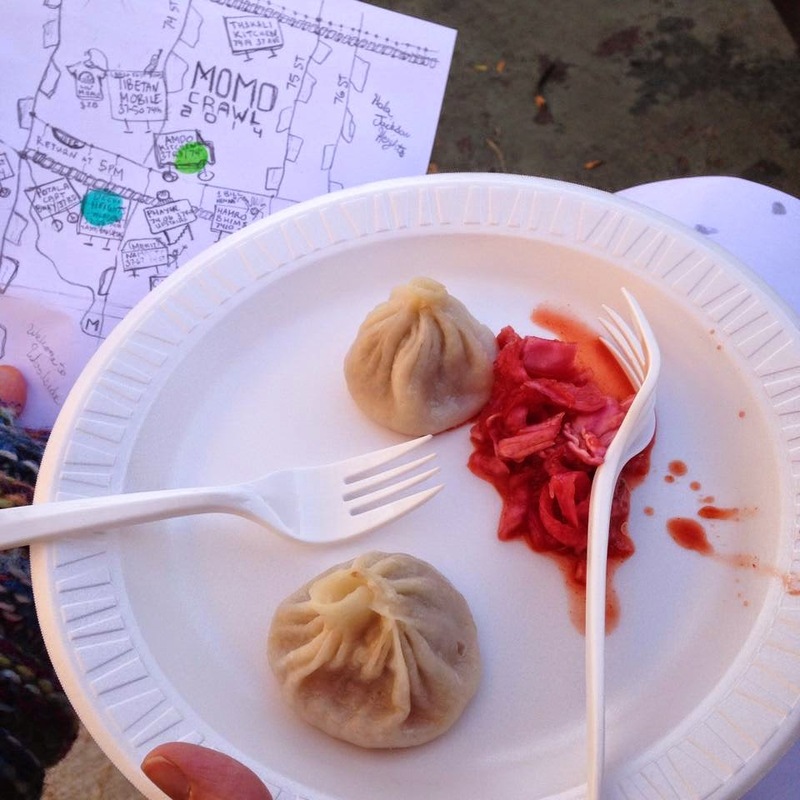 The Himalayan Yak Momos were good and both sauces were yummy, btw, in case you were wondering. Waiting in line at Little Tibet for Momo #10. Yelp indeed, Caroline. Yelp indeed. 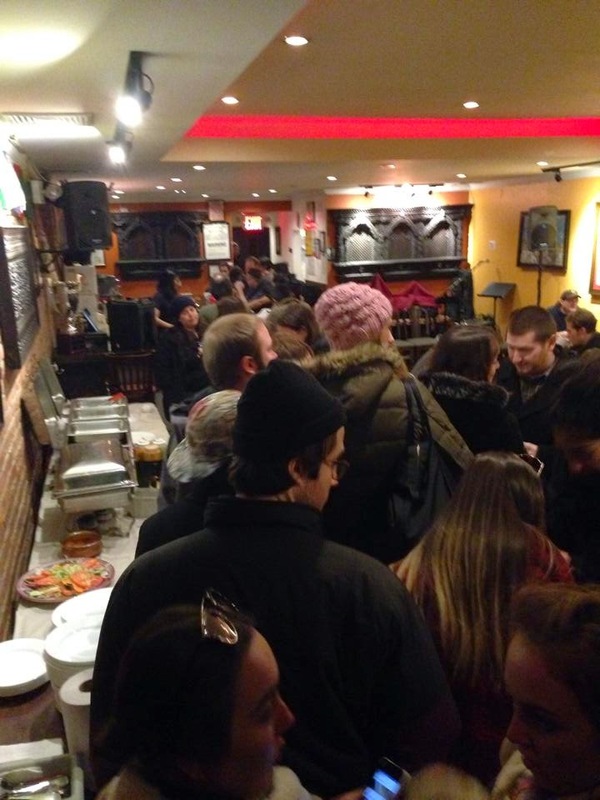 Scene at Little Tibet with 10 minutes left in the Crawl. Girl, I know how you feel. Momo #10: Little Tibet - Beef Momo. "The Last Momo". We sat down for this one. The lighting perfectly matched my state of being, as if someone splashed darkroom chemicals in my eyes. I want to eat this Momo to prove all the doubters wrong. I want to eat this Momo to make it end. I want to eat this Momo because it's probably delicious. I will do this. Beef Momo and awesome sauce. REALLY YUMMY. WE MADE IT! HUZZAH!!! 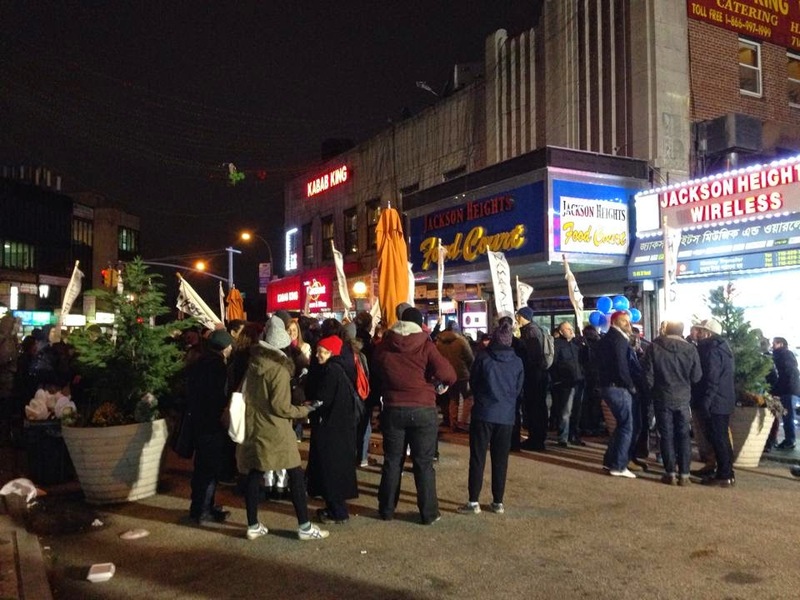 Then, it was time to head back to the Jackson Heights Food Court and VOTE! Simple Democracy Rules: Line up at the flag of your favorite Momo Crawl Establishment, hold hands with the person in the line parallel to you (even though they've been eating Momos all day and may or may not have been using utensils), and whichever line is the longest is declared the winner! I was genuinely torn between Gangjong and Little Tibet. I chose Gangjong because (along with the Amdo Kitchen Truck Pikliz) Chef Tenzing's Hot Sauce was one of my very favorite flavors of the day. The taste danced beautifully and lingered all over my entire palate. Each part experiencing layer-after-layer of new and exciting flavors during all that lingering. SO MUCH LINGERING! The coveted Golden Momo Trophy! Who will it go to?? And the winner is... LHASA FAST FOOD aka TIBETAN MOBILE!!! Though, in a way, we're all winners. Aren't we? 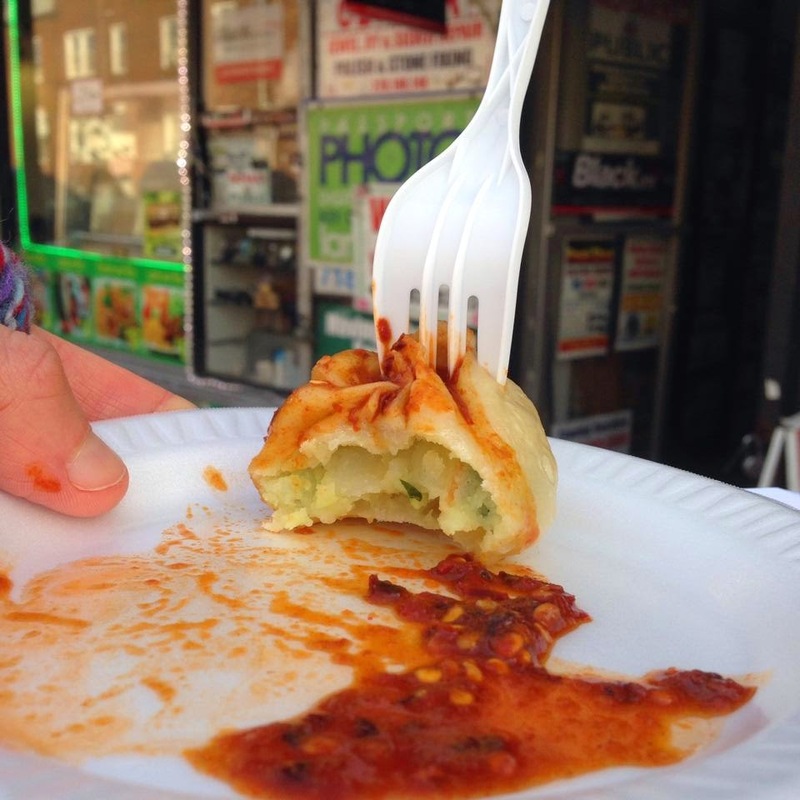 I ate 10 Momo from 9 Vendors and learned that Jackson Heights isn't just about Indian Food, it's also about Himalayan food. And I saw a Taco cart too. My physical and mental state ran the full spectrum, going from happy and excited Momo Eater, to listless, hopeless Momo Soldier, to punchy, wired, Momo Lunatic. For a while, I felt like dying and stuff, but at no point regretted my decision to participate and push myself. In fact, I fully intend to go back at some point to finish the damn crawl, because my map is missing 8 stamps and I HAVE A WARRIOR'S SPIRIT! Huge thanks to Jeff Orlick for organizing this incredibly fun and challenging day! I'd definitely do it again and would absolutely recommend it to others! At the rate with which the Momo Crawl has grown, I hope the Vendors are prepared for next year's massive influx of people. 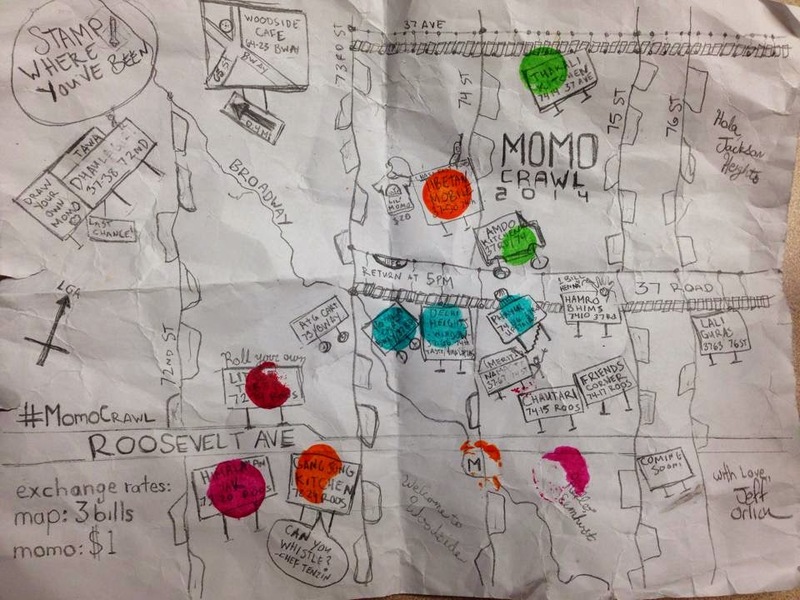 One suggestion I'd make is that each Momo Crawl Participant be limited to 1 (or 1 of each type offered) Momo at each location, as not to create unexpected Demand punches to the Kitchens' intricate hand-made Supplies. It seemed as if the biggest lines were created when 1 person would order 10-20 Momo to take outside and meet their friends-- which, I commend the teamwork, but it really ended up screwing the next 10-20 of us that were waiting in that line, as the Kitchens had to play catch-up by the batch, rather than being able to service a steady stream of 1's. 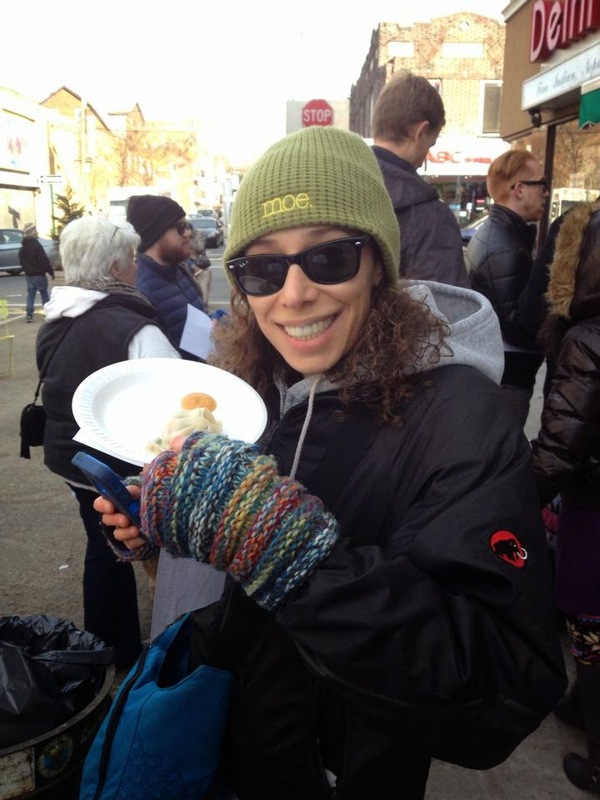 Caroline's suggestion is more about Earth-friendliness and is a pretty easy request to ask of the crawlers-- everyone should get/bring their own single fork for the duration of the crawl, which would cut back on the disposable fork waste considerably. This is a great idea coming from someone who could have simply suggested, "Everyone wear socks!" 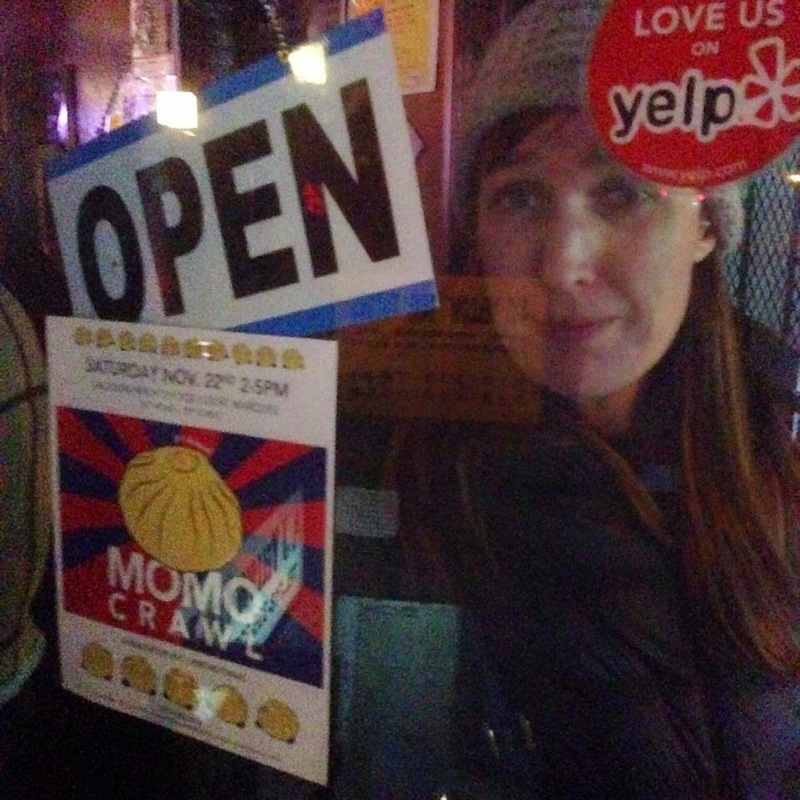 Momo Crawl 2014: 4 out of 5 Golden Momos!